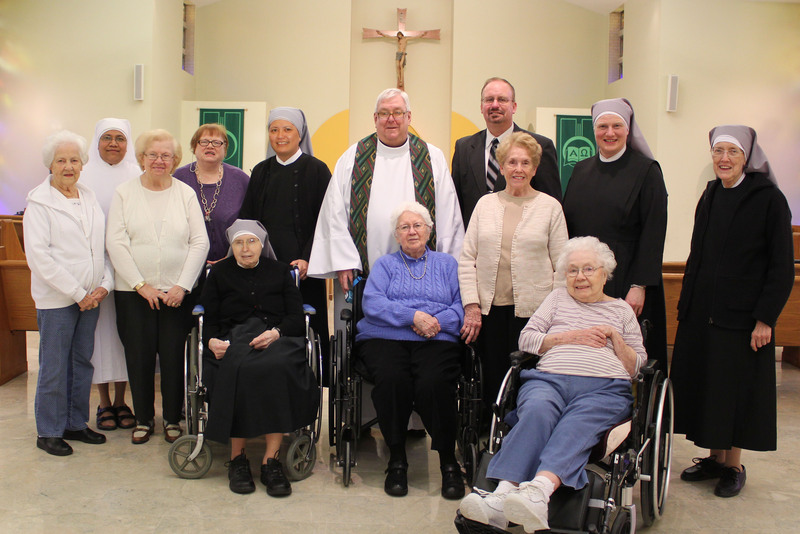 SCRANTON, PA – The Little Sisters of the Poor at Holy Family Residence marked the Week of Prayer for Christian Unity on Tuesday, Jan. 19 with a public prayer service led by the Rev. E. Francis Kelly, chaplain of Holy Family Residence, and the Rev. David Twiss, pastor of the Green Ridge Assembly of God Church. This special week, which takes place annually January 18-25, strives to build unity between various faith traditions. Pictured are the participants of the Week of Prayer for Christian Unity prayer service hosted by the Little Sisters of the Poor at Holy Family Residence on Tuesday, Jan. 19. Seated from left to right: Sister Esther, l.s.p. ; Frances Norton; and Kay Gallagher. Standing from left to right: Peg Munley; Sister Laurelliya, l.s.p. ; Bernice Bullick; Karen Graham; Mother Theresa Louisa, l.s.p. ; Rev E. Francis Kelly, chaplain of Holy Family Residence; Rev. David Twiss, pastor of the Green Ridge Assembly of God Church; Mary Grace McHale; Sister Cornelia, l.s.p. ; and Sister Mary Augustine, l.s.p.